The past decade has seen advances in techniques for manipulating and measuring physical objects at the quantum level, opening a new avenue for research – Quantum Metrology. This includes quantum imaging, frequency standards, and precision time measurements. New quantum techniques offer promise for increased sensitivity and resolution. This REU project focuses on using intrinsically quantum states of light for ultrafast spectroscopy and imaging of macromolecules and other systems including biological a nd photosynthetic ones relating to light harvesting. Two-photon entangled states have the potential to provide simultaneous time and frequency information beyond the usual uncertainty limits, to provide enhanced microscopic spatial resolution without the deleterious effects of photo-bleaching, and to excite molecules or semiconductors along certain pathways with enhanced control. 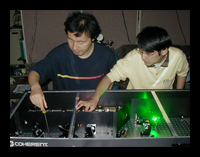 The REU student may work with diode or titanium-sapphire lasers, single-photon detectors, optical fibers, interferometers, nonlinear optics, and computer interfacing.